All eyes were on England for the Royal Wedding. Find out what happened as the modern-day prince and princess lived out the fairy tale! Wherever you were on April 29, we're sure you were eagerly anticipating the main event that's had the whole world buzzing for months. According to the BBC, over 24.5 million people tuned in to witness Prince William of Wales wed Catherine "Kate" Middleton in a lavish ceremony at the Westminster Abbey. Many of the details such as the dress design, guest list, and the couple's new titles remained top-secret until the big day. But, the public got to see Kate's mystery gown before the groom did, as she rode to the church in a state Rolls-Royce car with her father. Amidst all the rumors and speculation, the wedding party succeeded in pulling off one of the grandest, most memorable weddings the world has ever seen. Read on for more details on the wedding of the century! If you were one of the unfortunate few who missed out on the live coverage of the wedding, you should check out this ceremony timeline that details all the major events of the day—from the arrivals to the balcony kiss—down to the minute. Before the ceremony, Queen Elizabeth II bestowed on William and Kate their new titles: Duke and Duchess of Cambridge. William was also named Earl of Strathearn and Baron Carrickfergus. Although technically she does not carry the title "Princess Catherine" since she is not a princess by birth, the public and British press continue to refer to her as Princess, similar to the way William's mother was colloquially called "Princess Diana" after her wedding. The world let out a collective gasp when Kate stepped out in her long-sleeved lace gown by Sarah Burton, creative director of the Alexander McQueen label. The romantic gown was delicate yet structured--a perfect choice for a modern-day princess. It also drew comparisons to the gown Grace Kelly wore during her wedding to the Prince of Monaco in 1956. 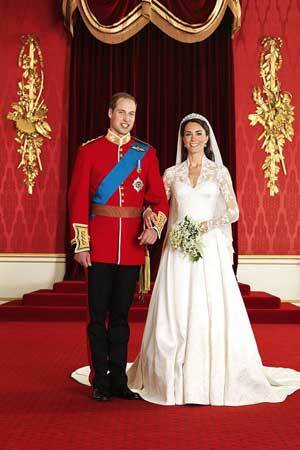 To complement the dress, the wedding accessories also played a big role in Kate's overall appearance. Her simple veil was made of soft, ivory silk tulle with a trim of hand-embroidered flowers, and fastened by one of the Queen's Cartier tiaras. Her earrings were diamond-set and inspired by the symbols of her family's coat of arms. Her shoes were hand-made by the Alexander McQueen team from ivory duchesse satin with lace hand-embroidery. Kate's bouquet, designed by Shane Connolly, was simple and understated, so as not to draw attention away from the gorgeous gown. The flowers were all quintessentially British, comprised of lily-of-the-valley, hyacinth, myrtle, and the appropriately named "Sweet William." The hairstylist who styled Kate's modest look on the big day was James Pryce, from her long-time salon, Richard Ward. The "demi-chignon," a relaxed half-up, half-down syle, was created to suit Kate's personality. While Pryce and Ward worked on Kate, a team of seven other hair stylists tended to the other members of the bridal party, including Kate's sister Pippa and mother Carole. As previously announced, two of the most famous names in Britain showed up at the royal event. David and Victoria Beckham turned heads when they arrived early in the day looking classy and sophisticated. He opted to carry his Philip Treacy top hat, showing off his combed-back coif and Ralph Lauren coattails suited for a prince. She wore a Philip Treacy head piece, Louboutin heels, and a pregnancy-friendly navy blue gown from her own collection. Other famous wedding guests included Elton John and his partner David Furnish, singer Joss Stone, director Guy Ritchie, and numerous foreign royals who flew in just for the special day. Following in the footsteps of Lady Di, Kate omitted the word "obey" from her wedding vows, instead promising to "love him, comfort him, honor and keep him, in sickness and in health." The couple carefully discussed the wording of their vows with the Archbishop of Canterbury, who oversaw the nuptials. This has been seen as a break from traditional conservative values, since royal brides before and after Diana have included obedience in their vows. After the ceremony, photographer Hugo Burnand captured some of the sweetest moments of the day at the Throne Room of Buckingham Palace. The newlyweds were all smiles as they were surrounded by their bridesmaids and page boys, as well as the rest of the Royal family for their official wedding portraits. The photos are bright and vibrant, injecting a youthful energy into the typically serious royal image.